Get ready for our 20th Annual Year End Performance! 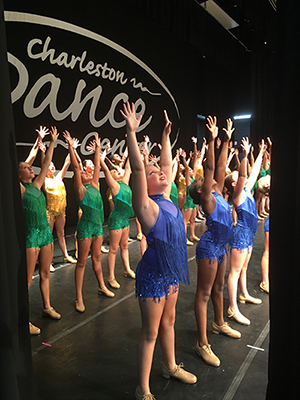 Every Charleston Dance Center student is invited to perform in this incredible show. We know how exciting this event is for both our dancers and their families and we work very hard on every aspect of the performance. The Matinee Show includes all of our Preschool Classes, Pre-Jazz/Tap, Pre-Ballet, Pre-Hip Hop and all of our Just Dance! competition teams. Our Solo Pre-Show includes all Just Dance! soloists. THIS SHOW IS INCLUDED WITH A TICKET TO THE EVENING PERFORMANCE. The Evening Show includes Ballet Levels I-IV, Jazz/Tap Level I-II, Contemporary Levels I-IV, Hip Hop Levels I-IV, and all of our Just Dance! competition teams. Tickets for this show include entrance to the Solo Pre-Show at 3:30 p.m.
Tickets will be available starting at noon on May 1, 2019. You will select your seats when you purchase tickets, so plan to buy early for the best seats. Children under the age of 2 do not need a ticket for admittance (but they will not have their own seat). Included in each family’s Year-End Performance fee are two tickets per dancer (three tickets for families with more than one dancer). Just Dance! company members in both shows will receive one additional ticket. All other tickets will have to be purchased. To receive your free tickets, you will enter your email address on file with us at Charleston Dance Center in the promo code box on our ticket website. The $1 per ticket fee will not be added to these tickets, however you must go online to select your seats. Tickets will also be available at the box office on the day of the show, starting at 11 a.m., provided the show is not sold out. Tickets are $15 each. TutuTix charges a low, fair fee for their service. You’ll see their $1 per ticket fee, plus 5% processing charge added to your order at checkout. If you have any questions, or problems with your purchase, please call TutuTix directly at (435) 222-2849 ext 5, or email support@tututix.com. The Year End Performance fee includes a DVD of the entire show and a Year End Performance t-shirt. The DVD will be available at registration for fall classes. Flowers and other gifts will be available for pre-order – details will be available in April. Year End Performance programs will be available for purchase for $8 cash. 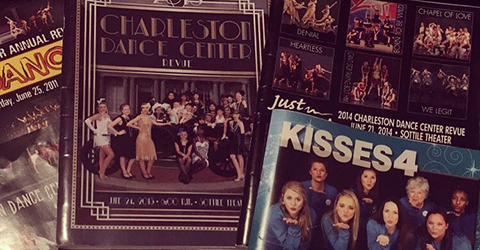 These must-have books are a recap of the entire dance season and include a photo of every class. Make sure you have a personal ad for your dancer – ad deadline is April 18, 2019. Learn more about the 2018 Year-End Performance Program Ad Contest.